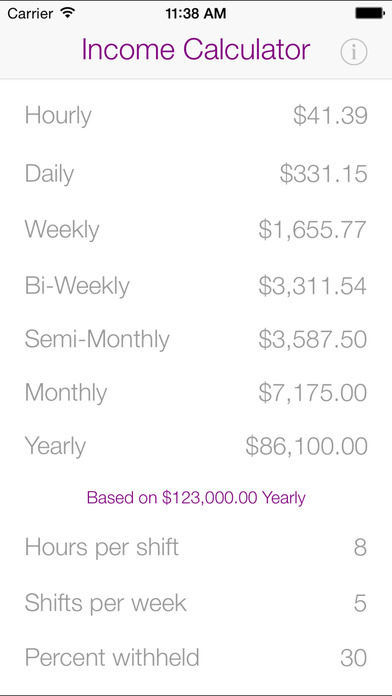 See at a glance what your pay rate adds up to over different periods of time. When you are being offered a job or a pay raise, you are usually told what your salary will be in terms of dollars per hour, or dollars per year. In order to make a quick, informed decision about whether the amount being offered is acceptable, it helps to be able to see what this amount equates to over other lengths of time. Income Calculator was created to serve this single, simple purpose. You just enter the known amount in any one field, and the others are instantly calculated for you. You can also adjust the number of hours you work in each shift, the number of shifts you work each week, and you can enter a percentage that is withheld to estimate how much you you would take home after taxes.